Mazzer is by far the most respected and revered name when it comes to commercial quality espresso grinders. 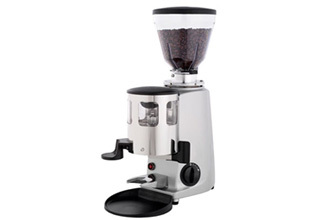 The Mazzer Mini is the ideal choice for any small espresso bar! The Mazzer Company was established in 1950s as a precision machine workshop and became in few years a leader manufacturer of commercial coffee grinders and grinder dosers. From the beginning Mazzer never changed its philosophy oriented to precision and reliability of its coffee grinders which led the company to be today the reference manufacturer in this sector. The whole process of manufacture is carried out with advanced technologies and strict quality controls, which have seen Mazzer become the bench-mark by which all grinders are compared too.